Has Crooked Hillary done enough to succesfully rig the election, or will Donald 'Small Hands' Trump upset the pollsters and grab victory by the George W? 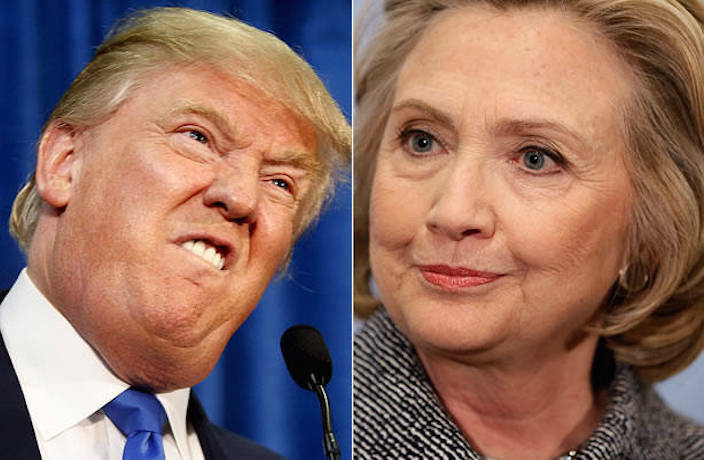 The long drawn out battle between quite possibly two of the least popular presidential candidates the campaign trail has ever known is reaching its thrilling conclusion on November 8 (or November 9 in China). The polls are close and showing signs of narrowing, the only certainty right now is that you’re going to want a (big) drink to hand for when it all goes down. RELATED: QUIZ - Who Said it About China - Trump or Clinton? Whether Democrat blue makes you see red or if you think the nation's right is just wrong - get down to one of these spots and witness history in the making. The Shed is a no-frills sports bar with cheap drink prices and they will begin their coverage from 8am. There will be a breakfast menu on offer. See a listing for The Shed here. "It's basically going to be me apologizing for my country from 7am," says bar manager Mike of The Hop Project, which will broadcasting coverage from 7am. Breakfast and coffee will be available for those who don't want to enter the new world on an empty stomach/need some lining for the session as they drink the pain away. Ned Kelly's famous Tuesday night quiz (currently being held here while Camel Puxi undergoes renovations) will have a presidential theme next week too, so make sure you know your Roosevelt from your Roosevelt. See a listing for The Hop Project here. The Camel's Pudong branch has 17 large screens spread out over two floors, so it should be pretty easy to find a good spot to watch the results. Bring sunglasses to avoid potential overexposure to glaring a fake tan. The usual happy hour deals will be available from 4-8pm. See a listing for the The Camel (Pudong) here. Entrance will be RMB100 for members, RMB150 for a member company employee and RMB250 for non-members. They will be showing coverage from 8.00am to 12.00pm. Coffee and pastries will be provided. See a listing for The American Chamber of Commerce here. Organized by Democrats Abroad in China, so expect pant suits rather than power ties. Coverage will start at 7.30 am and entrance will be RMB50. Included in the price is your choice of coffee or OJ, along with a selection of pastries. RSVP for the event here - electionwatch2016@yahoo.com. See a listing for Liquid Laundry here. Watch Election Day madness go down on November 8 from 6pm, as well as on November 9 from 7am onwards at The Brew. They've also got a happy hour from 3pm to 8pm. See a listing for The Brew here. In the same compound as Maya, The Hustlers Lounge will be tuning into the election at 9.30am with deals on Mexican food and drinks: RMB25 Sol, RMB35 micheladas, RMB40 big breakfast burritos, RMB20 breakfast tacos and more. Reservations are required and owner Rob warns "you'll have to climb the wall to get into Mexico" if you want to watch. See a listing for The Hustler's Lounge here. Did we miss your 2016 Election event? Email us at events@urbanatomy.com with your event details and we'll add it here. We speak with Douban Music's Zhao Yue on the state of the music industry in China in 2016. Where to watch the US Presidential Inauguration speech. Our look at the Best Albums of 2016 from Mainland China caps off with a trio of standout Shanghai discs, the evolution of a teenage jazz prodigy and the return of the father of Chinese rock. From icy Beijing indie rock to Peking Opera infused black metal from Changchun, our look at the Best Albums from Mainland China in 2016 continues. From Shanghai bass to Guangzhou shoegaze, our look at the Best Albums from Mainland China in 2016 rolls on. From Beijing future garage to a Chinese hip hop super duo, our look at Mainland China's Top 50 Albums of 2016 continues. From Shanghai jazz to the maturation of a Beijing dance punk institution, our countdown of the Top 50 albums from Mainland China this year begins.